Ever since I first came to England on a work exchange program after college, I fell deeply in love with everything about this country: The incredibly friendly people, the lush green rolling hills, and the medieval villages that take you back in time. At this point I've traveled to nearly 30 countries and for some reason that I can't quite put my finger on, England will always have a very special place in my heart. I'm not sure if it's because my ancestors are supposedly from there, or if it's the feeling you get sitting in a local pub with the locals sipping on cider, but I love this country more and more every time that I go. It's hard to narrow down recommendations- as you truly can't go wrong anywhere in the region. I would suggest allotting for several hours in each village and try to avoid the super touristy hours if possible (before or after all the buses of visitors are unloading.) I always love the lighting early morning or evening but that is not always feasible to manage when you have a lot to squeeze in. Bibury: For the adorable weaver's cottages of Arlington Row. Known as the "most beautiful village in England." Bourton-on-the-Water: a quaint village with a river flowing through. Low bridges along the water where children and dogs play and splash along the river. Go check out the Model Village which is a replica of the village from the 1930's. I also really enjoyed just wandering around the neighborhood to see all of the traditional stone houses. Burford: Known as the gateway to the Cotswolds. From the top of the village you can admire the steep downhill street and its charming houses. Chipping Campden: One of my favorites from the region because of it's rural farms that surround the town. It's known as a small market town but I was completely mezmorized by the elegant houses dating back to the 14th century. Castle Combe: A tiny village but still worth seeing. Wander the main street and sit along the river for nice views. Definitely go check out the Manor House and its gardens. The town of Painswick was once originally known for its wool trade but now infamous for its parish church yew trees and Rococo Garden. 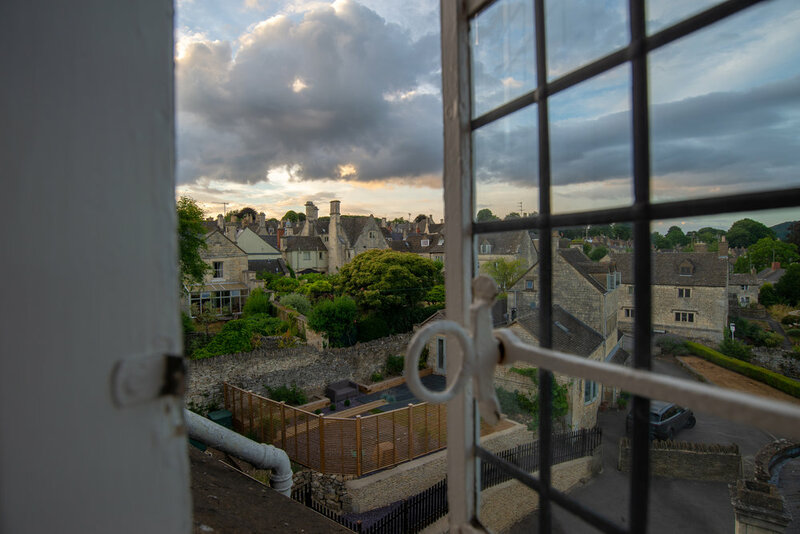 Painswick embraces winding streets leading you to impressive vistas, immaculate gardens, darling cottages, and scenes of cow farms in the distance. The Painswick Hotel has recently been refurbished into a trendy and chic boutique hotel a few years ago, but its origins date back to the 18th century. From the outside, the historical grounds exude rich history and fits in with it's neighboring village. But inside, one can only be pleasantly surprised. With modern touches and colorful decor- the hotel has everything a traveler would want from comfy beds, contemporary amenities, and captivating views. In the mornings we would wake up for a jog to explore the village followed by visiting in the breakfast parlor with the other guests. During the afternoons we would explore the never ending mazes of backwoods leading from village to village, never missing a chance to indulge in local cuisine and cream teas. Upon evening we wandered the church grounds through barely legible grave stones and beneath the tunnels of the yew trees, ending with a cocktail on the patio of the hotel. Guests gather on the lawn and terrace to enjoy the sunset over a drink before dinner. While the hotel is perfect for an over night stay (or 3)- it's also well known for it's modern and innovative kitchen. The dishes stem from traditional British recipes to an imaginative and delicate plate- filled with color and brimming with flavor and better yet, on the healthier, less guilty side of things. The progressive kitchen is one of its kind in the region.